You want to spend less time entering data into a computer so you can spend more time with your patients. And so, inevitably, you’re looking at Dragon Medical Practice Edition 2 speech recognition software. But it has to work with your electronic medical reports system. And you don’t have the time or the patience to deal with a glitchy experience. So here’s what we have been able to discover about which of the electronic medical records systems popular in Canada that Dragon Medical Practice Edition 2 works best with. First – Dragon Medical Practice Edition 2 works well with pretty much every popular mainstream Canadian EMR (electronic medical records software) other than Wolf EMR. Wolf EMR is a cloud based product of Telus Health. Dragon Medical Practice Edition 2 does not have good compatibility with it. The software still works, however you cannot dictate directly into Wolf as you can with most of the other EMRs out there. Secondly – Dragon Medical Practice Edition 2 works best with non-cloud based EMRs. So basically, if you have one of the many non-cloud based EMRs popular across Canada then you’re golden. It even works with French EMRs. And it is the only medical voice recognition software that is EMR compatible. Dragon Medical Practice Edition 2 has medical vocabularies that covers nearly 90 specialties, “out of the box” recognition of regional accents that is enhanced by the software’s ability to learn through advanced adaptation techniques and accent-specific acoustic models. You can use it to fill out templates, write reports and dictate notes on the go. Dragon Medical Practice Edition 2 will still work with cloud-based EMRs popular in Canada – it just struggles with certain templates so you can’t take advantage of its more advanced features. However, anywhere you would see a blinking cursor on your cloud based EMR, you can still enter data using Dragon Medical Practice Edition 2. One of the interesting things about EMRs across Canada is that they are fairly region specific. So if you’re a doctor in Toronto, there’s a good chance you’ll be using Accuro. While a surgeon in Halifax is quite likely using Practimax. Here’s a brief alphabetical look at some of the most popular Canadian EMRs so you can make your own choices. ABELMed is built on the Windows platform and provides a complete range of electronic medical record capabilities and practice management features. It integrates seamlessly with Dragon Medical to save you time and money. Record voice files on-the-go, in your clinic or at the hospital. Voice files are quickly converted to text and loaded directly into your patient encounters through integration with ABELMed. It features a patient manager that monitors wait times and visit time, lab and prescription modules. It allows you to easier track patient trends by graphing their vitals. It also helps with you effectively manage chronic disease patients with customizable flow sheets that track the status of their conditions, customize clinical/administrative parameters for disease tracking, receive alerts for abnormal values and receive notification if the recommended intervals for follow up are missed. AccuroEMR works seamlessly with Dragon Medical Practice Edition 2 and while spreading across Canada, it is currently most popular with doctors in Ontario. A lot of smaller practices, ranging from three to five doctors, use this EMR. It is essentially a suite of medical software modules that provides computer-based medical records for Specialist, Primary Care, and Allied Health Professionals, as well as administrative modules for billing and patient scheduling. Accuro EMR software provides electronic storage and instant availability of clinical information to authorized users at the point of care. It also has over 500 premade form templates ready to go and allows you to create, manage and track prescriptions. CIS EMR by P&P Data Systems Inc. This full suite EMR incorporates modules to handle prescriptions, laboratory results, inventory and scheduling. Templates and quick entry codes allow you to document a visit quickly and efficiently with just a few clicks or keystrokes. Data is collected from your patient’s labs, immunization history, active drugs, and more, in order to create a complete cumulative patient profile so you can see all your patient’s crucial medical information at a glance. Despite ongoing efforts to increase electronic communication, much of today’s medical information is still coming in on paper or fax. The Paperclip module helps your clinic manage all these pieces of paper that crosses your desk. Using powerful scanning technology, the system will identify and file each document into the appropriate patient’s file or section of CIS automatically. Clinisys EMR is a web-based software application built for various types and sizes of medical clinics to create and manage patient electronic medical records. It handles scheduling, billing, email alerts, sms messaging, e-prescription, e-referral, e-billing and patient records. It works on mobile devices and is extendable to third party software and devices. EMR Advantage is a fully integrated electronic medical records system that allows physicians to perform all standard practice related tasks. EMR Advantage supports small, medium and multi-location practices in managing all patient, 3rd party, and hospital billing. Flow sheets available within EMR Advantage allow physicians to closely monitor chronic care patients without devoting a substantial amount of time to data collection. Incorporated within the EMR Advantage application is the ability to track performed services and add exclusion and bonus codes for procedures included within the Cumulative Preventative Care program. EMR Advantage generates eligibility lists, first and second contact letters and virtually manages preventative care programs for physicians. Other features include: schedule management, electronic lab results, prescription management, letter generation, auto-generated tasks, hospital reports, custom forms, cumulative patient profile, billing, follow-up, and wait lists, consult requests, lab results mapping, callback generation, referral result letters, chart lock security and transcription templates. Like the most other EMRs, MOIS handles both sides of the practice – medical and business. accounts receivable, billing summary reports, MSP billing, WCB billing, custom reports and schedules are all handled by MOIS. On the medical side, it handles encounter notes, prescriptions and labels, health issues history, allergies, past procedures, consultation and referral reports. Its clinical calculators allow for the automatic uptake of necessary values form the medical record to calculate body mass index (BMI), predicted peak expiratory flow, gestational age, cardiac risk, and other indicators. Based in Nova Scotia, Practimax works on PC's running any Windows operating system, Mac's, Windows Tablets, Android Tablets and iPads. It also well with Dragon Medical Practice Edition 2. Practimax comes with over 250 Nova Scotia specific Smart Forms pre-loaded. It offers automated patient appointment confirmation and alert services via phone and text messaging, one chart at a glance convenience. As well, it makes it easier to create prescriptions. Practimax advertises that its IT managers will work with customers to create customized templates and charts to suit each practice’s needs. Profile is an integrated Practice Management and EMR designed by Canadian physicians, MOAs and administrative staff for use in Canada. Profile is available in Office and Enterprise editions, stand-a-lone, ASP or centralized, so it can be customized to the needs of solo physicians, large corporate entities or health authorities with thousands of users. Profile helps manage appointments, encounter notes, medical records, lab results, billing, referrals etc. Basically, it aims to take you one big step closer to being a paperless office. The YMS EMR is specifically designed for specialists running a specialized practice. It is smartphone and Mac compatible. Standard features of YMS include, an uncluttered user interface, electronic prescribing and refill management, electronic labs, lab graphing incorporating medication use, personalized patient alerts, flowsheets to follow trends, print on any form, auto-populating of notes and reports, OLIS Integration, HRM integration, lab requisition and reconciliation management, role based security and task management. 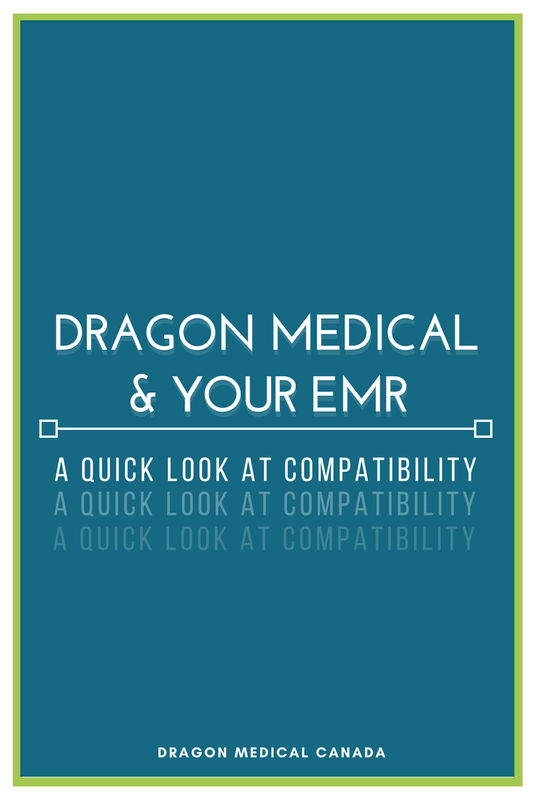 This list is by no means an exhaustive list of the EMRs that are compatible and integrate with Dragon Medical, for that you will have to click here, but it does provide a good snapshot of which of Canadas' most commonly used EMRs are used with Dragon most often.